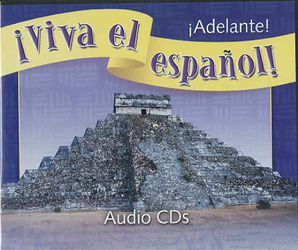 Recorded by native speakers of Spanish of varied ages and backgrounds, the Audio CDs contain the vocabulary sections of each regular unit of the textbook as well as selected other material. The Audio CDs also contain conversations and features to provide students with opportunities to hear the language spoken native speakers in simulated real-life situations. The conversations and features not only synthesize the vocabulary and structures of each unit, but also serve as practical examples of the language in use. In addition, the Audio CDs contain exercises that further students’ practice in distinguishing sounds and in using the structures of the language.